Seven kids at summer camp are unexpectedly transported by 'digi-vices' to a colorful and enigmatic world. Lost and alone, they are befriended by small digital monsters, Digimons. The kids and their Digimon partners quickly become inseparable, and the strange creatures guide their human friends through the wondrous DigiWorld, protecting them from the hordes of evil Digimons. The group soon discovers that some of the giant Digimons they encounter are not evil Digimons but good Digimons gone bad. A dark power is corrupting even the most gentle of Digimons by embedding Black Gears into them, turning them into vicious monsters. Creating chaos and destruction wherever it goes, the evil power threatens all of DigiWorld. As they try to find their way back home, the seven kids are drawn further and further into the mystery. Through teamwork and trust, they help their newfound Digimon friends digivolve from 'monsters in training' to giant champions that must save the DigiWorld from the powerful evil intent on destroying it. Digimon Adventure was published in English as Digimon by Tokyopop from March 11, 2003 to August 12, 2003. Well, critically speaking, Digimon was no masterpiece. A central part of my childhood and something I still enjoy today, but I can acknowledge that I'm a little biased. 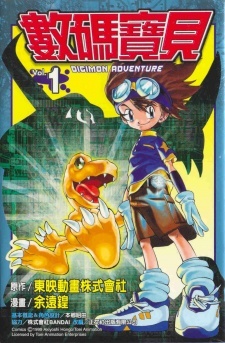 The Digimon manga (the two series that I read anyway; I can't speak for the following ones) was one of those odd occasions where the manga was published after the anime had already aired to completion. What seems to me a clear show of the creators trying to capitalize on their success as much as possible. Five volumes to cover 54 episodes... The Digimon manga is basically Digimon Abridged. They cover the general story and the most important plot points, albeit in a rushed way. The artwork really isn't any better than in the anime, which is to say, pretty awful. All the characters are introduced and all that, but I can't say the Digimon manga is anything special, or even worth reading if you've already seen the anime. Like with the trading cards and toys, the Digimon manga strikes me as just another outlet for the company to make money. Vaguely enjoyable if you're a kid who's already in love with the franchise, (as I was) but not anything you need to track down to fully appreciate Digimon.